Celebrations in Kurdistan after Iraqi Kurdish leader Masoud Barzani declared the region had voted ‘yes’ to independence. He called on world leaders to respect the outcome of the referendum. ‘‘One of the decisions taken by the council of ministers today was to take control of the border crossings, both land and airport, in the (Kurdish) region as well as in federal Iraq. The national security council had issued this decision before, but today the council of ministers made it obligatory. And this includes all the border gates and the suspension of all external flights from and to the (Kurdish) region, including the flights to and from the airports of Irbil and Suleimaniyah”, said the PM. Ankara said Turkey was also considering punitive measures, which could see food supplies to Iraqi Kurds cut. Iraq’s prime minister, angered by a vote onindependence by his nation’s Kurdish minority, has given the country’s Kurdish region until Friday to surrender control of its two international airports or face a shutdown of international flights. Kurdish leaders in northern Iraq had antagonized Iraq, Turkey and Iran by holding the referendum on Monday. The results have not yet been announced, but the Kurdish Regional Government said on Tuesday that the vote had gone overwhelmingly in favor of independence from Iraq. A “yes” vote would not lead to an immediate declaration of independence for the semiautonomous region, but it would direct the regional government to begin the process of creating an independent state, including negotiating a separation with Baghdad. Turkey's president has warned of an "ethnic and sectarian" war in response to the Iraqi Kurdistan referendum, while the Iraqi prime minister has ruled out talks with the Kurdistan Regional Government (KRG) over the outcome of the controversial vote. In a televised speech from Ankara on Tuesday, Recept Tayyip Erdogan threatened to impose sanctions against the semi-autonomous Kurdish region, saying it "will be left in a lurch" and its people would go hungry. "If [Iraqi Kurd leader Masoud] Barzani and the Kurdish Regional Government do not go back on this mistake as soon as possible, they will go down in history with the shame of having dragged the region into an ethnic and sectarian war," Erdogan said. Iraq’s semi-autonomous Kurdish region has finished voting on a controversial referendum that could potentially lead to a new independent country. It is a goal that Kurds around the world have long pushed for, but it potentially touch off a broader conflict involving Iran, Turkey, and Syria, as well as test loyalties and allegiances between the Kurds and dozens of nations and ethnic groups throughout the Middle East and beyond. On June 7, 2017, President Masoud Barzani, the present head of the Iraqi Kurdish Regional Government (KRG), met with various parties and formally announced the date for the non-binding poll as Sept. 25, 2017. Barzani, who has been president of the KRG since 2005, had initially called for the vote in 2014, following the meteoric rise of ISIS in Iraq following the spectacular collapse of the Iraq’s national army in the face of the terrorist group, but delayed it due to apparent international pressure. With ISIS in retreat and the situation stabilizing, it has been harder to argue for further delays. I find it sad that these people can't have their own nation. As jubilant Iraqi Kurds celebrated their vote Monday on independence from Iraq, shooting off fireworks and parading in cars festooned with Kurdish flags late into the night, their neighbors conducted military exercises on the region’s borders, raising the threat of military intervention if it secedes. U.N. Secretary-General Antonio Guterres is expressing regret that Iraq's Kurds have gone ahead with an independence referendum. U.N. spokesman Stephane Dujarric said Guterres noted the referendum was "unilaterally declared, included disputed areas" and was opposed by Iraqi authorities and the global community. The spokesman said Guterres regretted that opportunities for negotiations were not seized and viewed the decision to hold the vote as potentially destabilizing. The vote held Monday was billed by the Kurdish leadership as an exercise in self-determination. To Baghdad, the vote threatens a redrawing of Iraq's borders, while leaders in Turkey and Iran fear the move would embolden their own Kurdish populations. Right, the people who have done the most to defeat ISIS are the ones who'll destabilize everything and give ISIS a chance to recoup. Right, perfect logic. Turkish President Recep Tayyip Erdogan threatened a military intervention in Iraq in response to the Iraqi Kurdish region’s referendum on independence from Baghdad. Last night, even before the ballots were tallied, millions of Iraqi Kurds were already celebrating the newest, boldest step along their generations-long path toward national independence. Drivers blasted their horns in the streets while youthful masses waving national flags paraded along the thoroughfares of Irbil, the capital of the semi-autonomous Kurdish Regional Government (KRG) of Iraq. As if to signal the eruption of Kurdish nationalist dreams, fireworks streamed throughout the skies. Earlier in the day, the Kurds had voted for their independence in a regional referendum. With over 70 percent of the 3.9 million registered voters turning out, all those casting predictions foresaw the same thing: an overwhelming national "yes" for an independent Kurdistan. The Kurds had every reason to celebrate. Beyond the borders of KRG, however, political actors were less cheerful. The government of Iraq offers no option for secession in its newly drafted constitution and its supreme court put a hold on the plebiscite — an order that was roundly ignored. Beyond the deserts of Iraq, Iran and Turkey conducted military drills along their Kurdish borders, apparently preparing for a possible conflict. Both countries have large Kurdish populations whom they fear might be excited into uprising by the emergence of a new and independent Kurdish state. After a request from Baghad, Iran has announced the halting of air traffic to and from the Kurdistan Region, a day ahead of the Region's historic independence referendum. “At the request of the Iraqi central government, the Iranian airspaces have been closed on all flights that originate from Kurdistan Region,” said Kaivan Khosrawi on Sunday, the spokesperson for the Iranian Supreme Security Council, reported by ISNA news agency and confirmed by state-run IRNA news agency. He said that Iran took the decision because Erbil did not cancel the referendum despite many requests by Iraq and Iran. The spokesperson added that it affects all flights to and from the Kurdistan Region with regard to Iranian airspace. Iran had threatened to close its borders if Kurdistan went ahead with plans to hold its referendum. Regional powers and Iraq’s central government threatened crippling economic sanctions and military action against Iraq’s Kurdish region on Tuesday, a day after Kurds staged a landmark vote for independence that is emerging as another crisis in a region roiled by civil wars and the fight against the Islamic State. Iraqi Prime Minister Haider al-Abadi said Kurdish leaders had committed “a strategic and historic mistake” by holding the referendum and gave them until Friday to hand over control of airports and borders in northern Iraq to the federal government. If the order is ignored, international flights to the Kurdish region will be suspended, Abadi said. Abadi also said that any oil revenue from the Kurdistan region — a critical economic lifeline for the semiautonomous enclave — must be returned to Baghdad, though he did not set a deadline for the demands. Tehran vowed on Tuesday to stand alongside Baghdad and Ankara against the outcome of an independence referendum staged by Kurdish authorities in northern Iraq, a day after thousands of Iranian Kurds marched in support of the vote. State media also quoted an army commander as saying that new missile systems were installed on Tuesday, a day after the referendum, in western provinces that border Iraqi Kurdish areas to “firmly respond to any invasion”. Iran, Iraq and Turkey - countries with Kurdish minorities - have all denounced the referendum as a threat to the stability of a region already beset by conflict, while the United States has expressed similar disquiet. We've found the solution towards getting the Muslim dictatorships to agree on something: independence referendums! This is seriously giving me some October Revolution vibes. That exposes Iran's double standards when it comes to their stance on Israel/Palestine. People like them constantly complain about the Palestinian's situation, yet completely gloss over the fact that the Kurds have gone through the exact same thing for the past century. There is a battle between democratic confederalism and representative democracy in revolutionary Rojava right now. Their leader Abdullah Öcalan read Bookchin in prison and has largely been arguing in favor of his work. A cult of personality has formed around Öcalan, but Öcalan for the moment is not acting authoritarian and the people have gained real knowledge of what a world without the state might look like. It is yet to be seen whether or not this revolution turns sour, but I think that the social revolution in Kurdistan is much more mature than it ever was in pre-bolshevik Russia. In any case, democratic confederalism is significantly more anarchic than other governance models and I wish them luck. Here's hoping that the Kurds aren't painted as terrorists once ISIS is defeated. Expect all governments to vilify the Kurds soon. If their revolution remains a threat to the status quo, all of the capitalist world regardless of religion or race will attempt to crush them. This is bigger than Middle Eastern squabbles, if the Kurds continue to adopt anarchic models they could spur a revolution that will change the world as we know it. First the poorer countries would get hit, their governments would be eaten alive from the inside by their own people. Given a few decades of crushing automation induced economic crisis and the rest of the world would follow suit. 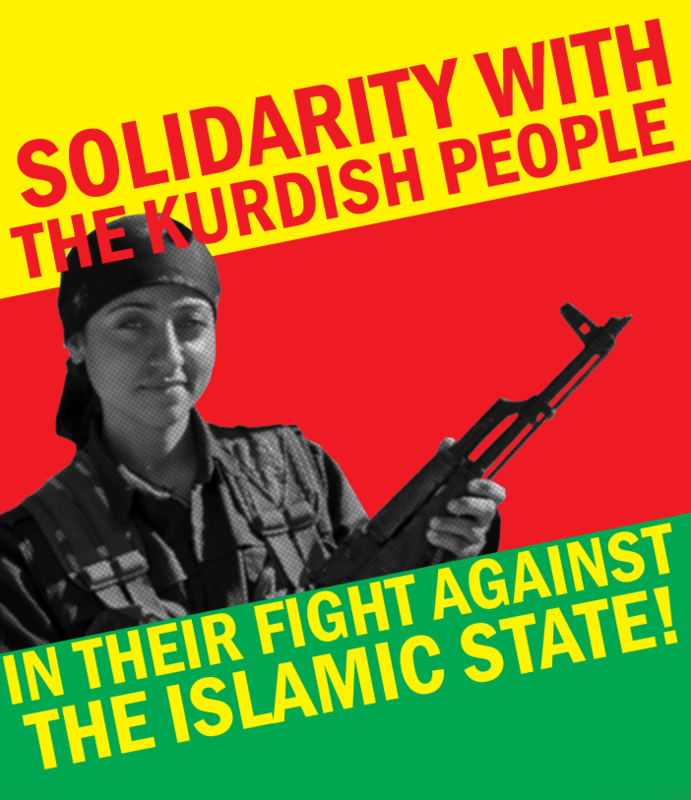 I don't really think the Kurds could incite a global revolution against Capitalism and the state. This isn't the great depression, a lot of people are happy with the current governments they live in and those who aren't happy with the current government (specifically democrats) don't want an anarchistic system, they just want a different government. Don't expect change to come from these cushy precariat nations, it's always the slaves that strike back first! I don't expect anarchism at first per say, but the 21st century is prime for a resurgence of socialism and I feel that this time it might be democratic in nature, which would ultimately lead to anarchic forms of communism, hopefully with a large amount of automation. Yes I understand, but I don't see why the people in the 1st World countries which are happy with their lives would want to join this rebellion? Sure the people of the poor nations might want to, but if people are happy with their lives and their current government then I don't think they would revolt. Sorry for going slightly off topic, but how do you make text bigger if you want to edit a post? When you're typing a reply, there is a toolbar at the top. Just click size and choose how big you want it to be.